The Hollister Urinary Leg Bag Combination Pack is available in size medium and large with a low profile Leg Bag design to be as discreet as possible against the leg. The leg bag retains urine for individuals with incontinence or non-ambulatory patients after surgery. The pleated sides allow the bag to lie flat as possible as it fills up to create more volume without a bigger bag. A set of fabric straps with low profile buttons secure the bag comfortably to the leg. The vinyl bag and fabric straps are latex-free to not irritate the skin for users who have a latex allergy. Choose from vented and non-vented systems of the urinary leg bag combination pack. The vented option helps prevent air build-up in the bag. Each system is made with an anti-reflux valve design ensures urine back flow into the tubing. A blue convenience drain is found at the bottom of the leg bag to drain as needed. The drain is easy to operate, even with limited dexterity. Hollister Combination Urinary Leg Bag Pack (9348, 9349) comes with a non-vented leg bag, non-sterile extension tubing and connector and a pair of leg bag straps. 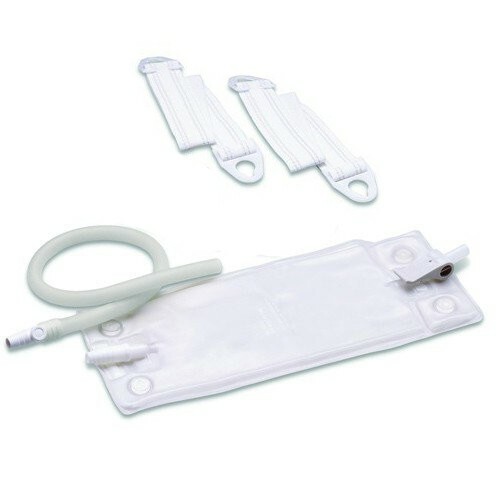 The vented urinary leg bag combination pack (9645, 9655) comes with a sterile leg bag, sterile Kink-resistant extension tubing and pair of leg bag straps. Vitality Medical supplies a variety of incontinence products and male external catheters to work with leg bags. You may be interested in the Male External Texas Catheter. We do not carry this product in our warehouse and therefore cannot accurately answer your question. It's best to contact the manufacturer of the product for material clarification and other specifics. Some pros & some cons! I like the heavy vinyl the bag is made of. Durable & don't need to worry about it getting easily punctured. However with no flock or cloth backing it can be hot and sticky at times. I like the way the straps attach except that since they are like no others you can NOT use old straps from others as spares. Also the connectors on the ends have sharp edges that sometimes cut into the leg and it gets painful. Especially a problem for the top strap when worn in the common location just under the knee. I like that it holds a quart, but when full the straps are not adequate to keep it from slipping down and pulling hard on the tube. Make sure you push the tube on to both connector ends as far as you can. Even the end attached is not well seated and the first time you fill the bag it may pull out of the tube. What a mess that makes! The tube is a soft rubber in a flat oval shape rather than hard plastic round. Soft is more comfortable and the flat shape makes it even more flexible, however it also makes it prone to kink suddenly when bent just a bit too far. It would be better in that same material in a round shape with thick walls to a void being kinked or flattened. Best foley leg bag and kit on the market. Easy to use re-order and comfortable to wear! Bag is well made - pleats add capacity without increasing size.Not only are the straps comfortable, they WORK! Having everything in one package is very convenient. Easy to order and fast service. I really appreciate having everything I need for a bag change all in one package! The drain with cap increases confidence. The straps are the easiest to use of any I've tried.